The other day I was driving down from Hyderabad to Guntur and Vijayawada on some personal errand. The stretch between Nalgonda and Piduguralla on the NAM express way is relatively free of heavy traffic. As I was cruising along at a steady speed my mind relaxed and eyes wandered taking in all that was moving past. As I drove in silence to the white noise of FM channels gibberish passing by big and small villages and modest towns it suddenly struck me how easily and subconsciously one can make out when one crossses state borders. The colors of bill boards and flexis change from garish pink to thick yellow hues as I leave behind Telangana and enter Andhra. These eyesores that deface an idyllic village or a sleepy town are in general self congratulatory messages lauding their party leadership ( Usually but not restricted to the CM ) Some even as inane as gaint Birthday wishes erected by the chota mota chelas of the party looking for earning some browny points from their political lordships. Smiling faces fitted in “round” circles and or life size images of chieftains donning color coodinated party flag clothes ( the colors can be saffron , pink , yellow , khadi white , blue or red etc. ) smiling patronisingly at you declaring their great achievements in bold fonts. 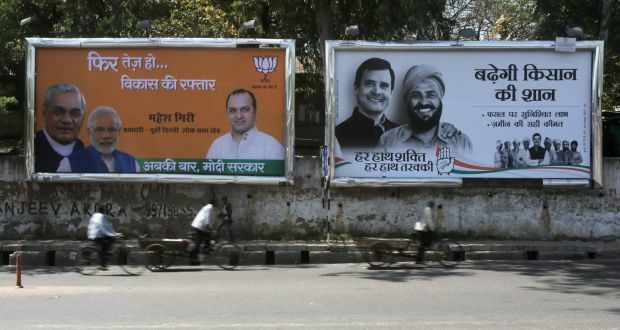 Typically such hoardings , billboards and flexis carry messages of their undying love for the poor masses and list out various ‘Government schemes’ introduced by his / her highness during this term for the upliftment of the aam janta. Never mind the ground reality which would be the exact opposite . Now I have no problem with these so called grotesque displays of showmanship. Infact it amuses me at their desperate attempts at peddling lies of ‘achievements’ where there were none. And the poor language of the script writers some times leads to hilarious moments of mirth and fun. I also don’t have problems with these eulogies of sycophancy as long as these eyesores are the outcome of party propaganda where the bills for billboards are footed from the party funds or by some sychophant chelas looking for some browny points from their masters who erected them at their own expense. However most often that is not the case. The advertisements be it print, billboards or TV ads come from assorted ministries broadcasting their ‘achievements’. So naturally the bills have to be paid from Government chest. What is reprehensible is the impunity with which these political parties in power splurge public money to promote themselves more particularly the party leader who occupies the throne of state or central. It would appear as if the king of good old feudal times decides to give away jagirs to those who please him with their clown tricks. Mind you this malady of self promotion and image building is not just restricted to the Telugu states but the scrouge is a pan India epidemic with centre at the centre of this infestation . One can imagine what would be the bill on national exchequer when all state governments’ ad bills are also added up. Who gives them this entitlement to abuse public funds? A large portion of it obviously went into buying alliegance of pliable media to give it a positive spin or conversely threatening adamant publishing houses with stoppage of Government ads thus buying their silence. The carrot and stick policy of government advertisements has worked wonders on Indian media which proved more than willing to bend over backwards for the lure of lucre. It is now crystal clear that political parties across the spectrum are guilty of appropriating public money for self promotion and image building. The genesis of this ‘disease’ has its roots in the grand old party of India , the congress. In its hey days its leadership deemed it as its right to christen every sundry scheme, every institution and every project after the Gandhis. From street to airport to project the name would have a Gandhi in prefix or suffix. Records suggest that as many as 90 odd institutions and 60 odd schemes bear Gandhi family name. This charade was fuelled further by over enthusiastic regional satraps of congress ruled states which competed against one another in these naamkaran ceremonies and foundation stones. Anecdotal evidence suggests that Y.S Rajasekhar reddy former CM of combined Andhra out ran others by naming most of the Government schemes after the Gandhis. Now with the turn of tide at centre , saffron is the colour of choice and Hindutva stalwarts are the choice of names from bulidings to streets to schemes. All bill boards , print ads and tv ads now have to display a salt haired slightly bearded Modi in designer Nehru jackets ( No its Modi kurta and jackets now…..even apparel could not escape the renaming and repackaging experts) grinning from ear to ear or posing in sombre deep thought. The respective ministers of ministries from where the ad emanates are restricted to small insignificant rings at the top or bottom end of the ad. Circling back to Telugu states which was the reason for this article, I found out that the current truncated Andhra Pradesh government has as many as 21 schemes named after ‘Chandranna’ which literally translates to ‘Big brother Chandra’ a term of endearment for Chandrababu Naidu occupying CM’s chair of an impoverished state. The title is a psychological ploy to burnish Chandranna’s name in the minds of masses for recall value. Much like amma of Tamil nadu. Chandranna hopes fervently that the name catches on. And so the frenzy of naming every sundry scheme after Chandranna to cash in on recall value at the time of elections. After all his name doesn’t lend itself to the more charming abbreviations such as NTR , his party founder or his betenoires YSR from congress and KCR of TRS. CBN abbrieved from Chandra babu Naidu doesn’t have the same ring to it. So the list goes and along with it out comes the propaganda material in the guise of government ads for schemes, propaganda material and so on and so forth. Lets look at another sample : Andhra’s next door neighbour Tamil nadu. TN did poineering work in self promotion and cult creation. You have Amma laptops for students, Amma salt for the masses, Amma seeds for the farmers, Amma cement for the commoners and even Amma baby care kits for the toddlers. And the mother of all schemes , Amma canteens for feeding the common man. Its Andhra sibling is christened ‘Anna canteen’ taking taking a leaf or two leaves from AIADMK rule book of self promotion. Amma canteen takes the color scheme of the matriarch’s party flag for its canteen design and so naturally Anna canteen gets yellow theme after the patriarch’s party flag. I vaguely recall a supreme court ruling which stated that except the president and PM of the country no one’s photo can adorn government posters , schemes or advertisements. And yet here we are being bombarded with propaganda from TV channels to bill boards to printed ads with peering , smiling, grinning faces of politicians big and small, tomtomming their great service to humanity and their mind boggling achievements. While I totally concur with the supreme court ruling I wish the court has gone one step ahead and barred the PM also from gracing the ads. You see my reason is very simple. PM is a political post that stands to gain immensely politically from the propaganda material . And if so why should Indian public foot his / her image building expenditure. Honourable PM should be freed from this stautory obligation and allowed to model for private entities for instance like PAYTM or JIO if he wants to. While I have taken only two samples to drive home my point I am hundered percent sure that the situation would not be any different elsewhere in the country. The root cause of a subservient media boils down to the fact that the Government controls and manipulates them with advertisement dole at their disposal. If the establishment does not have the power to manipulate perceptions with this carrot of government ads we can look forward to a cleaner polity , greater democracy and an unbiased media unafraid of ploiticians. The author is one who is taking baby steps in the writing arena. He is currently in between many things from learning crafts to crafting opinion on all things affecting humankind. He thinks of himself as a free thinker unfettered by dogma. Exactly! Our politicians often indulge in ‘ self – appeasement ‘ and ‘ self – praise’ at the expense of taxpayers who run from pillar to post for their daily bread. They are the one who need to be really praised …!! Well said.. written..tax payer money spent on publicity for promoting oneself was,is and never right. Will the courts have the courage to put an end? ?